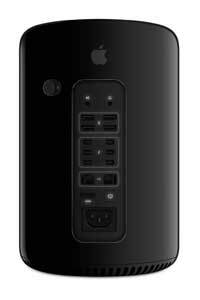 Apple is providing further details of its previously announced Mac Pro line. The cylindrical workstations are formally scheduled to ship in December. Apple has also revised its MacBook Pro laptop line with new processors. The Mac Pro stands at just 9.9 inches but sports up full workstation-class innards, including multi-core Intel Xeon CPUs (up to 12 cores per CPU) and dual AMD FirePro GPUs. The entry-level Mac Pro model is a $2,999 unit that offers a 3.7 GHz quad-core Intel Xeon E5 processor, dual AMD FirePro D300 GPUs (2 GB of VRAM per GPU), 12 GB ECC DDR3 running at 1,866 MHz, and and 256 GB of flash storage. The higher-end $3,999 model offers a six-core 3.5 GHz Xeon E5 and dual AMD FirePro D500 GPUs (3 GB of VRAM apiece). Additional configurations are available through the Apple Store, including eight- and 12-core CPUs, dual AMD FirePro D700 GPUs with 6 GB VRAM each, and up to 64 GB RAN and 1 TB of flash storage. PCIe-based flash storage with 1.2 GBps sequential read speeds. Apple has also launched new models in its MacBook Pro with Retina display line, upgrading those devices to fourth-generation Intel Core processors and improved graphics. The 13-inch model sports a dual-core Intel Core i5 processor (up to 2.6 GHz) or dual-core Core i7 processor (up to 2.8 GHz). The 15-inch model runs on a quad-core Intel Core i7 processor (2.3 GHz in the base model, but up to 2.6 GHz in a custom configuration) and Nvidia GeForce GT 750M discrete graphics with 2 GB of video memory. Improved battery life over previous models. The new MacBook Pros are available now. The 13-inch model starts at $1,299. The 15-inch model starts at $1,999. Additional details can be found on Apple's site.